This little children’s book proves that it is possible to write stories that are timeless. I suppose it is particularly true with historical biographies. 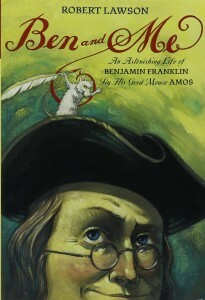 While some of the writing style or language might be slightly archaic, it feels perfect in a children’s book about Ben Franklin. More importantly, a biography like this is perhaps the best way to bring history to children without bringing tears of boredom. In Waldorf education, for example, history is usually taught through the biographies of people in an era. Reading this small example, I could easily picture Philadelphia during Ben Franklin’s day. Perhaps some facts need to be clarified later on, but the events depicted in the book are well-known moments. Another reason a children’s book like this is helpful is that it makes the main character much more human. Often we have stick figure images of historical people. Allowing the foibles of Ben to appear in his biography makes him even more valuable as an historical figure. Last, but definitely not least, this children’s book is fun to read. Since my grandson lives in Philadelphia, I’m looking forward to sharing it with him, bringing his own city’s history alive.